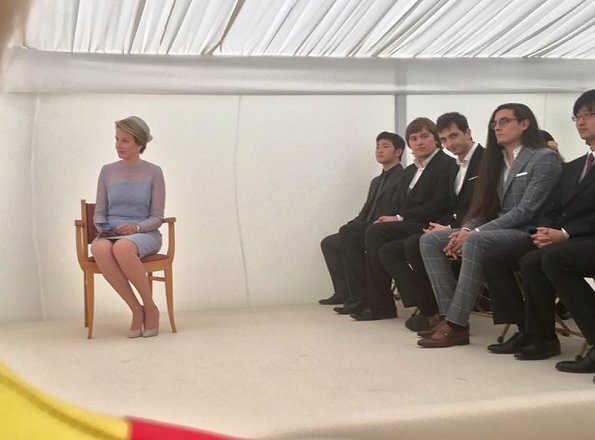 On June 6, 2017, Queen Mathilde of Belgium attended the presentation of the Queen Elisabeth Competition Prize at the Queen Elisabeth Music Chapel (Chapelle Musicale Reine Elisabeth) in Waterloo. This year, the Queen Elisabeth Competition was devoted to the cello. 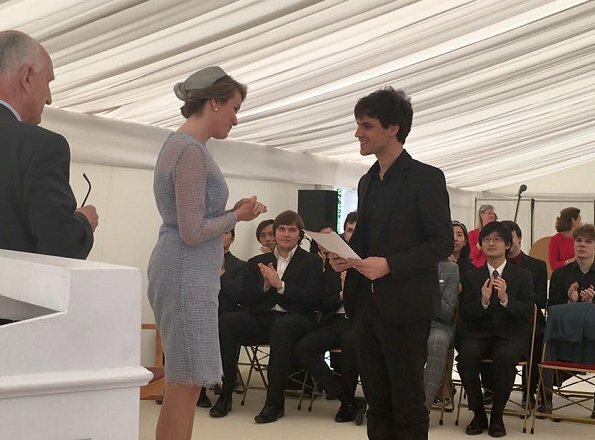 Victor Julien-Laferrière has won the 2017 cello competition! Not crazy about the dress, but Mathilde is as pretty and as poised as ever. I like the dress, beautiful colour, very interesting fabric which is so much bettet than that eternal, boring flowery lace. Mathilde has got beautiful eyes. Elegant dress, charming retro hat - she looks lovely. Very easy to connect Mathilde and sello music. El tejido del vestido es bonito y original, pero la parte trasera está mal confeccionada, hace bolsas y arrugas. Pero Mathilde está muy guapa. She is so incredibly glaceful and seems like a lovely person. Belgium is lucky to have her as it's Queen. Another cello event. I would like to see the King and Queen of Belgium address more important issues in Europe than chamber music. I'm pretty certain that the cellists of the world do not require a monthly royal endorsement to make their way in life - unlike children in poverty and the unemployed, for example. What a demagogic comment! This is not simply "another cello event", but the awards ceremony of one of the world's most prestigious competitions for young composers and instrument players and this year's edition has been dedicated to cello players. The Queen Elizabeth Competition is named after his patroness Elizabeth of Bavaria, Queen consort of the Belgians from 1909 to 1934 and great grandmother of the present King. The competition is one of the major yearly artistic events in Belgium and for this reason the Queen's presence is fully justified. Thank you for this information. This puts the event into perspective for me and other readers. My comment was not "demagogic," it was "populist," and with the information you provided it was definitely "misinformed." 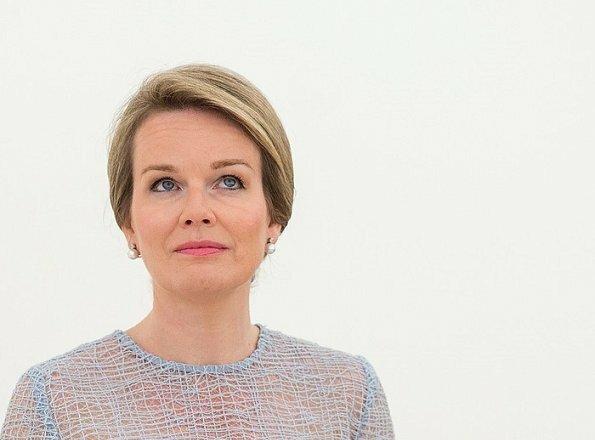 In fact we have seen Queen Mathilde at several cello events in the past few months while Europe continues to struggle with many serious issues including loss of life, diminished security, and economic instability, so I hope that as an articulate and well-informed person you can contribute to a more peaceful world. Love this colour on her. Works perfectly with her blue eyes and blonde hair. And I completely agree, such a stylish dress, not the perennial lace fit and flaire.